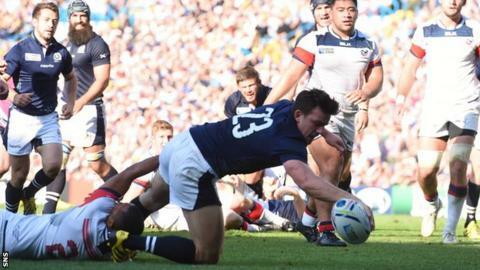 Ten points and ten tries achieved from the first two games is a very good start for Scotland at Rugby World Cup 2015. There were real parallels in performance between Sunday's win over USA and the opening fixture with Japan four days previously. A sluggish first half that probably put the fear into many a supporter's mind, only to produce very clinical, impressive second-half displays. Against sides such as Japan and USA it does take time to break them down. They are not bad teams and it's when fatigue starts to set in, physically and mentally, that opportunities arise and points can be put on the board. The first half against USA wasn't very impressive. There were a lot of handling errors and the decision making on the ball let Scotland down a number of times. It was as if Scotland wanted to score every time they touched the ball, which can be a risky business. When the back three of Stuart Hogg, Tim Visser and Sean Maitland were in possession they looked dangerous but that was more from broken field play and it wasn't constructed by patient phase play, where so often the lower seeded teams come unstuck. The ambition was great but the accuracy wasn't there and there wasn't the go forward created up the middle to put defences on the back foot. This is a selection issue and perhaps there wasn't the right balance. With lighter three-quarters of Finn Russell, Peter Horne and Mark Bennett, I believe that Sean Lamont needs to be on a wing to help win the gain line battle in midfield. There needs to be someone who is going to run hard and fast into the traffic and produce front foot ball for the players with more guile to utilise. Throughout the game there was some lovely handling from the forwards, often tipping or double tipping to each other, to try and play in between the defence. Ryan Wilson was very prominent in attack, carrying and distributing well. It's important to be consistently accurate with these plays though as on other days some of the team errors could have been punished more severely. The injury to Russell is a real concern as he provides much of the spark and creates space for the others in the backline. He always looks to challenge the line, which means that defenders are attracted to him and although his radar was a little bit off with some of his passes, his ability to pick the right pass whilst still looking to take the space himself is impressive. Matt Scott, although possessing the skills to distribute effectively too, took it upon himself to carry the ball hard at the USA defence. He twice received the ball straight off Greig Laidlaw plucking the ball from in front of the forwards. It is a very effective out-to-in running line as the defence line up to tackle the forwards opposite them and then as the pass is distributed, Scott runs at their blind spot. His try was the perfect example of this. The second half was just a lot tidier and more efficient. I'm sure the message at half-time would have been to just stay relaxed, be patient, build the phases and the tries will come. Everyone in the camp will be happy with where Scotland are at the moment but the big games are still to come and they can't afford to be slow out the blocks. Two good wins and things to work on, it's a good position to be in. P.S - For those wondering about the green blankets being worn by the Scotland players at half-time, they are 'space blankets' designed to aid heat retention. It is a strategy that has been put in place to negate the effect of the slightly longer half-time breaks that have been imposed by the television networks.